One of the fundamental elements of dealing with anxiety, particularly social anxiety, is how to recognize and respond to conflicts. People who struggle with social anxiety often ruminate on what types of conflicts they are likely to experience. The problem with this mindset is they find themselves overthinking. The think about what could go wrong and how upset they will feel about it. The irony is that they fail to realize by overthinking about what could go wrong, they are already causing themselves to get upset. For people who struggle with social anxiety, the origins of their anxiety usually stem from a period in their early life when they encountered ongoing social conflicts. As children, they were unable to resolve or even understand them. As a result, they have become involuntarily withdrawn from socializing. They have come to internalize a belief that they are incompetent at resolving conflicts with other people. This then leads to a self-fulfilling prophesy where as a result of habitually avoiding conflicts, they truly become inept at addressing and resolving difficulties as they arise. When I work with clients in this predicament, I work with them through a process of what I call the rules of engagement for conflict resolutions. The first rule I teach to clients is not to start conflicts with other people. This may come across as surprising, given that people with social anxiety are known to often avoid conflicts. Just because someone avoids conflicts, does not mean that the person does not instigate conflicts. People who habitually avoid conflicts, run the risk of forgetting about simple rules regarding social interactions. For example, spreading rumors about someone will most likely start a conflict. Socially anxious people can sometimes instigate conflicts is through passive aggressiveness. Making subtle insults and/or engaging in certain behaviors the other person will find offensive are ways that will communicate to another person that you have initiated an ongoing war between the two of you. When I have worked with people who have these tendencies, they have often expressed surprise when the other person has overtly or covertly retaliated against them. This retaliation then leads to heightened experience of anxiety, and in some cases, panic attacks. Be mindful of how you treat others, particularly those you do not like. 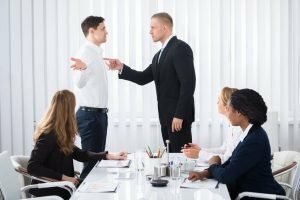 While you shouldn’t be afraid of asserting yourself but keep in mind most people will retaliate if they believe they have been slighted or attacked, either directly or indirectly. One of the most powerful ways to gain leverage during a heated conflict with someone, is to remain calm. The calmer you are, the less activated your reptilian brain is going to get, and the more access you have to your cerebral cortex. More access to your cerebral cortex means more access to higher thought and solutions for the peaceful resolution of the conflict. One of the best ways to practice remaining clam, is to stop overthinking and if possible, take long slow breaths, (you can do this discreetly, try practicing long slow inhales and exhales while you listen to others speak). While the practice of stopping overthinking is easier said than done, the key to accomplishing this feat is acceptance. From the first worrying thought you think about, accept it as a possibility. Then remind yourself that for most of your life things have always worked out for you. Further, you tell yourself that no matter about bad the conflict is, it will work out for the best. Once you find yourself easily moving past overthinking to a place of calm, you will find it easier to practice calm during conflicts with others. Some conflicts simply can’t be avoided. Some people, no matter what are out to make trouble, and that’s just the way it is. When you reach this level of thinking, you find yourself seeing the conflict as just another interaction that happens to be negative. It is important to note that if you find yourself in a conflict with someone who is bent on having that conflict with you, attempting to avoid the situation probably the worst thing you can do. Instead, allow that person to exhaust his or herself by doing all the work, and when push comes to shove, respond calmly to the situation. You will find yourself having easy access to a plethora of options regarding solutions on how to address the conflict. In summary, overthinking is grossly overrated. There are no problems or conflicts that you are not able to handle. The best way to overcome your fear of conflicts is to embrace them with calm while ensuring that you are not consciously or non-consciously instigating any conflicts. Ugo is a psychotherapist and life coach specializing in social anxiety. If you would like to learn more, call and book your first appointment or fill out my contact form and click Send.